DevLinks Updates « DevLinks, Ltd. 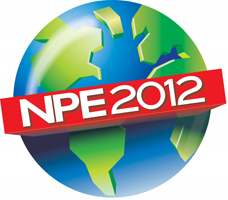 Fully Flexible IML Automation System From DevLinks, Ltd.
During NPE taking place on April 2nd thru 5th 2012 in Orlando, FL. DevLinks, Ltd. will present a completely flexible IML (in-mold labelling) system. The IML system includes a roll fed label being cut to a user specified dimension via an HMI. Additional printing is also available for date stamps, bar codes etc. The production cell will be producing beer mugs from Helm Tool on a Nissei FNX460-200BN1 High Cycle Machine inserted via a Wittmann W832 HS Servo top-entry robot. DevLinks, Ltd. is an automation manufacturer offering plastic processors in North America a complete range of innovative automation technology. DevLinks, Ltd. is an authorized integrator for Fanuc and Wittmann robots. Products include, but are not limited to; high speed laser cutting and marking, vision inspection, end-of-arm-tooling (EOAT), conveying systems and complete automation work cells.